SCS design is full set of explanatory, technical, and design documentation, that is passed to customer. It allows to save time, and rise efficiency of financial and human resources. Our experts will develop any quotation, and technical all the necessary documentation, that will satisfy world highest standards, and will allow you to realize this project even with other integrator. Our company create the designs, and successfully introduce projects of any kind. Correct design of cable network will guarantee that IT structure of your company will be reliable, easy too control, and give you high performance. It will not even look like a puzzle of cables, connectors and other network equipment. Documentation made by our engineers will help you to avoid problems and headache that our competitors have. SCS design created by us will serve for two three generations of equipment that will be connected to it. Payback: on making the design we follow all customer needs, thus all investments will return. Of course each of IT systems that is part of the entire system can be independent, but having correctly designed and carefully build SCS, you will have the reliable basis for IT structure of the entire organization. During the design process our experts look into the future, they have an understanding about future growth, e.g. to make necessary reserves for future workplaces, high-speed optics cables will allow to add them easily etc. And color code makes it much easier to read documentation, and to understand the direction and purpose of any cable. The important matter is that even cheap mid class equipment while connected perfectly will work more efficient then hi-class modern devices while connected in improper manner. 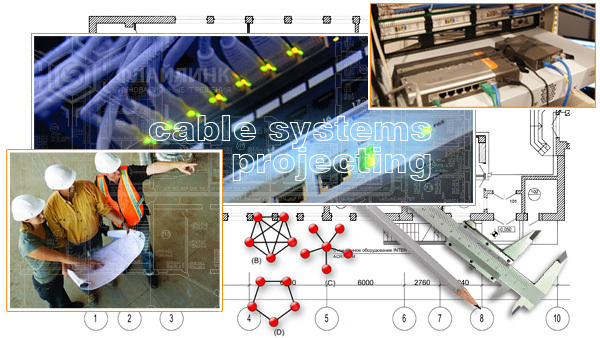 FlyLink Company performs professional designs of SCS, and also creates complete network structure. Starts from consultation in developing and certifying tech request to complete installation, certifying and validation, commissioning and service and support. It is better to work with one partner on all stages, because all work is performed within one company, by one team. It is much more effective then to coordinate several independent organizations. With help of our experts your network will serve you perfectly and never going to fail.